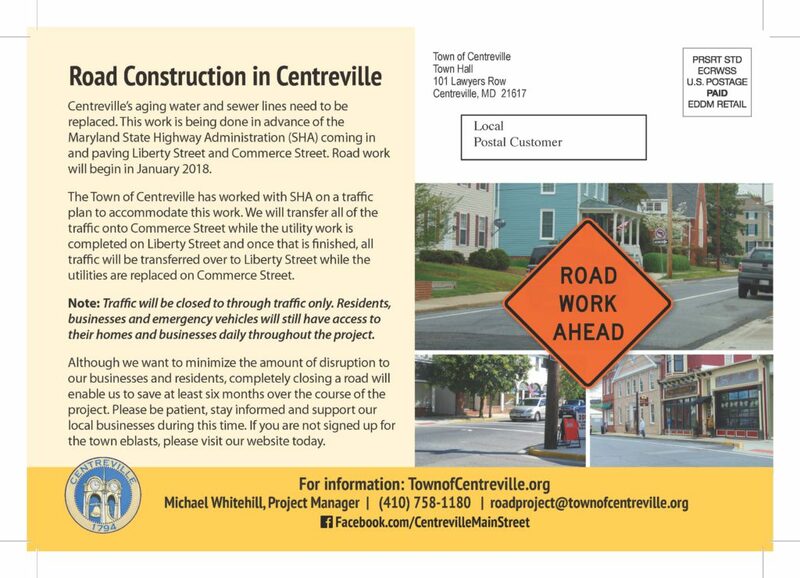 Please refer to this page for periodic updates to the Liberty Street / Commerce Street Construction Project. To sign up to receive the Town’s email blasts please CLICK HERE. Please be advised that there will be a one lane closure at the intersection of Liberty Street and Water Street on Tuesday August 21st between 7:00 a.m. and 5:00 p.m. to connect the new water main in Liberty Street to the existing water main in West Water Street. Flaggers will be on location to assist with the traffic pattern. The Liberty Street / Commerce Street Construction project is progressing well. 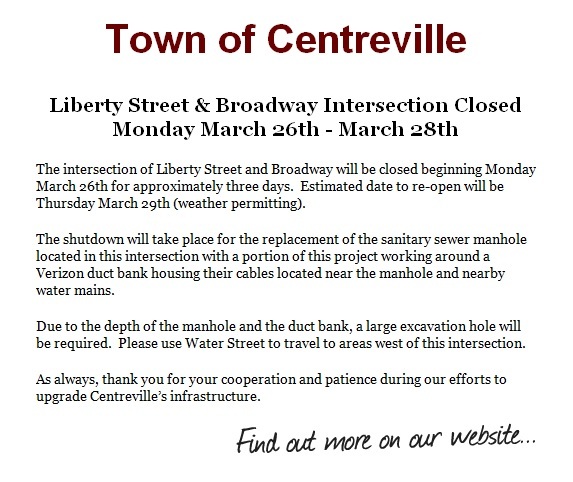 The contractor is installing the new sanitary sewer line on South Liberty (Phase 2). The concrete sub-contractor has been repairing sidewalk and curb in the Phase 1 section of Liberty Street. Asphalt patch paving of Phase 1 (North Liberty to Fayette Street) is anticipated to start early August. We are currently estimating the project to be 2 1/2 weeks ahead of schedule. CLICK HERE to read the information provided by the Maryland Department of Transportation State Highway Administration regarding the public meeting being held to discuss the replacement bridge on MD213 over Old Mill Stream Branch. This meeting is scheduled on Thursday, April 26, 2018 from 5:30 p.m. to 7:00 p.m.
March 29, 2018 Email Blast – To sign up to receive the Town’s email blasts please CLICK HERE. March 22, 2018 Email Blast – To sign up to receive the Town’s email blasts please CLICK HERE. Crews working on the sewer line on Liberty Street and working their way up to the Academy Lane intersection. 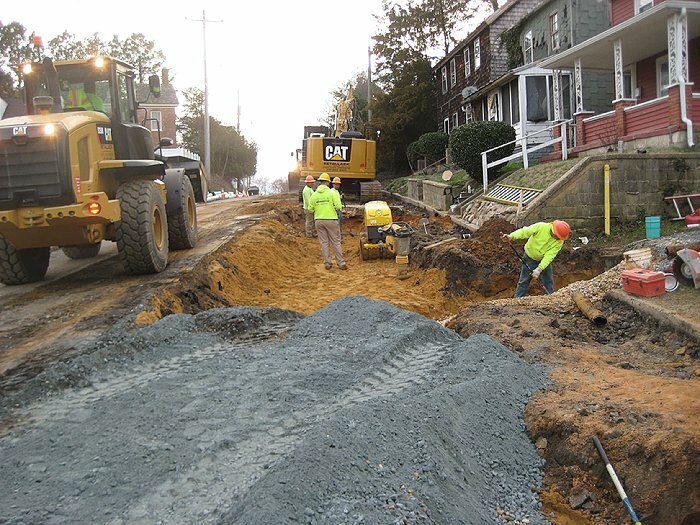 After much anticipation, the Liberty Street/Commerce Street Infrastructure project began on Tuesday, February 20. Adjusting to new traffic patterns can be challenging, but overall everyone is quickly making the adjustment. Here are some driving reminders to keep things moving along smoothly. 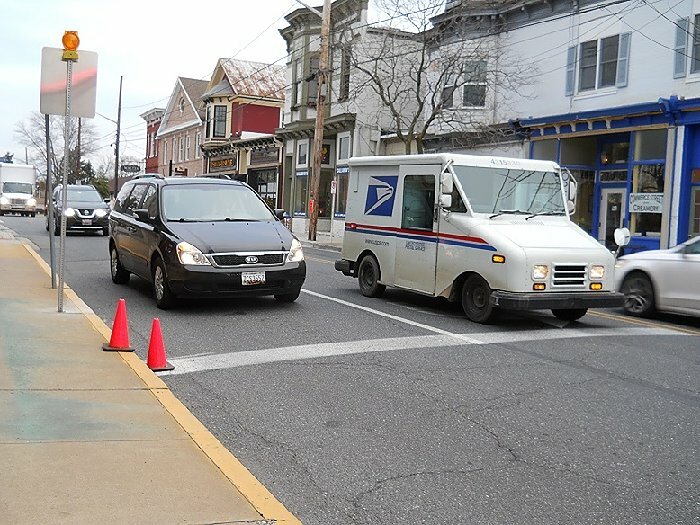 Please stop at the stop bars – Stopping past the stop bar makes it difficult for cars traveling toward you to turn safely, and it also affects the timing of the traffic light cycles. Please do not block driveways and intersections – Blocking intersections is a major contributor to delays as it prevents other drivers from being able to turn, which causes other lanes of traffic to stop and back-up. Road Closed/Local Traffic Only signs means that you can use the road if are an in-town resident, business customer or an employee working in town. Please use your blinkers (turn signals) – This is especially important for drivers approaching you as well as pedestrians. ​Liberty Street is open to local traffic only (and all traffic laws still apply) – Please do not travel the wrong way on Liberty Street or any other one way street and obey no parking zones. This is an example of how you should be stopping at the stop bars. Some of these tips can also be found on QAC-TV’s latest episode of Around Town with Mandy. If you haven’t seen it yet, check it out by clicking here. Our Centreville businesses rely on your loyalty. Please demonstrate your commitment to our businesses by continuing to patronize them during the infrastructure project. Don’t forget about our handy restaurant pick-up parking spaces throughout town: four on Commerce Street, two on Lawyers Row and one in the municipal lot by the post office. Restaurant pick-up parking spaces are intended for restaurant patrons going in and out quickly to pick up a take-out order. Please do not use these spots for stay-in dining. Here’s our parking map which indicates the restaurant pickup parking spaces as well as other convenient parking throughout Town. 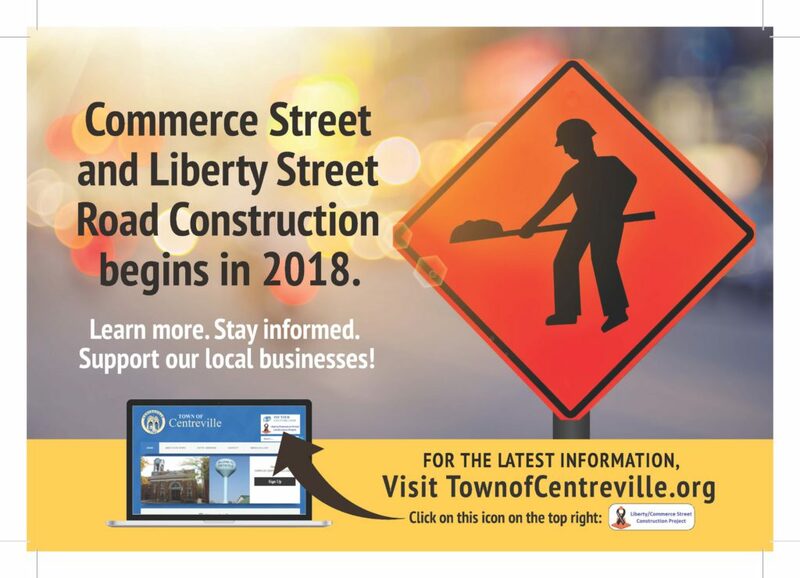 Based on the weather forecast, the Town plans to proceed with the painting of lines on Commerce and West Water streets starting Tuesday morning February 20th to begin the water and sewer construction project. 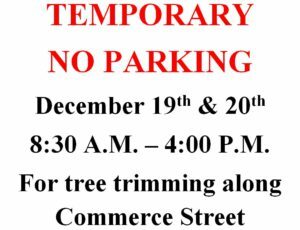 Late Tuesday night two way traffic on Commerce and West Water Streets will begin. Parking will not be permitted after Sunday February 18th on Commerce Street or West Water Street with the exception of four (4) spaces located in front of 112, 114, and 118 West Water Street. The Maryland State Highway Administration will be installing the required vehicle message boards within the town limits stating that there will be new traffic patterns ahead. Please keep in mind this plan is based on the current forecast and may be altered if conditions change. Due to cold temperatures or rain that has affected the painting portion of implementing the traffic plan, the earliest the Town may start this project is the week of February 18th. Staff will further evaluate the weather as this date gets closer and we will communicate the exact start date when it has been determined. 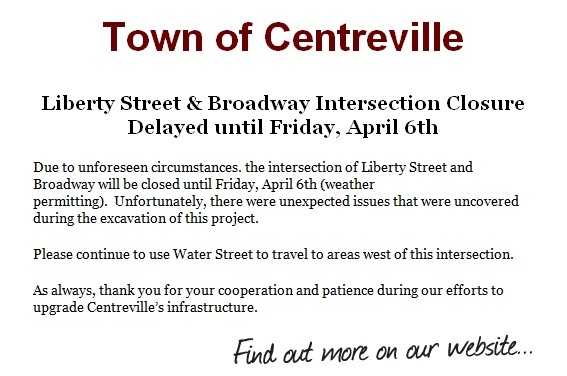 Thank you for your cooperation and patience during our efforts to upgrade Centreville’s infrastructure. Due to extreme weather that affect the paint striping part of the Liberty Street and Commerce Street Road Construction Project, two-way traffic will not begin on Thursday, January 4th. Further notification will be sent when the weather conditions are favorable to begin. 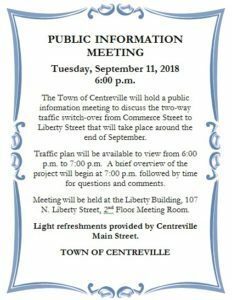 12/21/2017 – The Town Council will hold a Public Information Session on Thursday, December 21st, 2017 at 7:00 p.m. at the Liberty Building, 107 N. Liberty Street, 2nd floor meeting room to discuss the Liberty Street / Commerce Street Construction Project.